Open societies in which we try to settle our differences without violence have been a great human achievement. However, because freedom of speech is the prevailing view in Britain, we are not as alert to the risk of its overthrow as we should be. 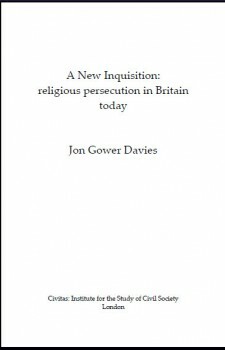 In A New Inquisition, Jon Gower Davies, former Head of the Religious Studies Department at the University of Newcastle, examines the new legal concept of religious hatred and provides striking examples from recent legal cases to reveal the oppressive and bizarre nature of judicial attempts to regulate such things. Hate legislation removes an increasing quantity of matters traditionally dealt with in civil society, to the domain of the state and the courts. Furthermore, the exercise of such legislation seems to create the very atmosphere it was designed to prevent – hatred. Jon Davies warns against developments which will make traditional public debates about religion and its critics impossible. He hopes for a British culture which validates a public seeking for religious truth and is more or less at ease with jokes and ribaldries, and he is profoundly ill at ease with censorship of them or with threats made against their authors. The freedom to speak our minds without fear or favour is worth fighting for. In A New Inquisition Jon Davies shows why the liberal majority needs to reassert the convention that the law should be used not as a weapon to suppress unpopular opinions, but rather as the protector of free speech. Jon Gower Davies retired from the University of Newcastle ten years ago. He lectured, first, in the Social Studies Department, and then in the Department of Religious Studies, of which he was Head. For 20 years he was a Labour Councillor on Newcastle City Council. He is the author and editor of books and articles on a wide range of topics, including Bonfires on the Ice: the multicultural harrying of Britain and In Search of the Moderate Muslim published by the Social Affairs Unit; and on attitudes to death and dying in the ancient religions of the world, published by Routledge. He has a particular interest in war and war memorials as definers of what he calls ‘Eurochristianity’. He was born in North Wales. From there, after the war, he went with his family to Kenya, then a British colony. He lived in Mombasa, went to school in Nairobi, and travelled widely through East Africa. After a short spell in the Kenya Regiment, a part of the British Army, he left for England to attend Oxford University. Two years in America, which included attending Brandeis University and participating in the ‘Freedom Summer’ in Mississippi, ended with his return to England. Since 1965, he has lived in Newcastle upon Tyne with his wife Jean. They have three children, who now have children of their own. He is a communicant member of the Church of England.